Benchmark Support Update: Why Do I Need to Verify My Email? Support Update: Why Do I Need to Verify My Email? One of the benefits of using Benchmark Email is that you are given the option to decide which email address you would like to display as the "From" and "Reply" address in your campaigns. Many clients take advantage of this feature by having several different addresses to choose from. This makes it that much easier to personalize each email campaign for the particular group of subscribers being contacted. You will notice that two of my email addresses have already been verified and that two are pending. The Support Department has noticed an increase in the number of clients who contact us immediately after adding a new address to request that it be marked "verified." Many clients are not aware that they need to do something further, though, before the address can be marked as verified. The status will remain as "pending" until action has been taken on your part. A confirmation email has been sent to the new email address you have provided. Once you open that email and follow the instructions, you will be able to utilize the new email address. Check your spam or bulk email file. There are a myriad of ways email service providers sort incoming emails. Because these sorting rules are fluid, you may find that important emails are wrongly sent to your spam or bulk email file. Check those files to see if your verification email is in there. See if your service is blocking emails from us. Some email service providers may prevent you from receiving certain emails. If this happens, the email will "bounce," which means it won't show up in your account - even in your spam or bulk email file. We have an extremely low bounce rate at Benchmark Email, but if you suspect that our emails are being blocked, click on the Help tab in your Benchmark Email account for assistance. Send us a verification request. If the verification email never shows up, even in your bulk or spam file, just send us a verification request. To do that, send an email to support@benchmarkemail.com from the address you wish to verify, with the word "Verify" in the subject line. Once our support team verifies your email address, you can use it to send out messages to your recipients. Does this sound like it might be a little too much and possibly unnecessary? Wouldn’t it be easier to just enter any address without this hassle? Well, there is a method to our madness. 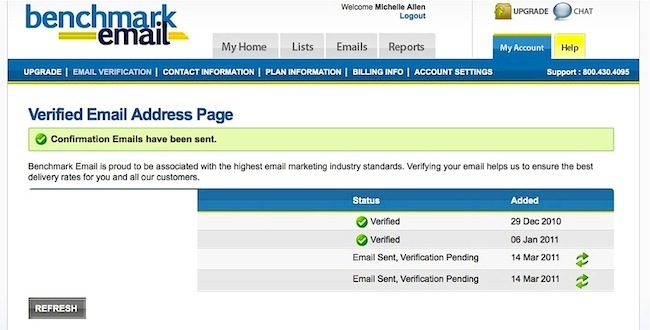 Email address verification has become a standard practice in the email marketing industry. Why? Because it prevents a sender from using fake and often unreachable "From" and "Reply" email addresses. This illegal practice, called spoofing, has resulted in many states creating laws that require that marketers verify the email addresses they use to send emails and field responses. Verifying your addresses helps us to ensure the best email delivery rates for you and all our customers.